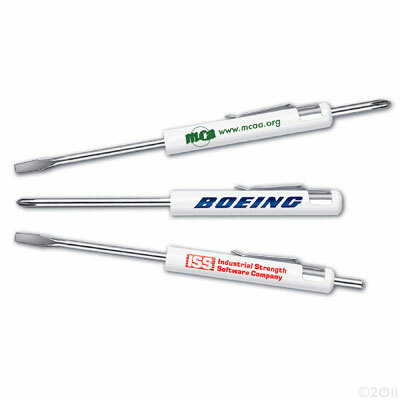 Promotional pocket screwdrivers imprinted with your custom logo is the ideal way to keep your name in front of your clients all year long. Pocket screwdrivers come standard with flathead tip or are avaibale with an optional Philips head or a double ended option. Snap on pocket clip keeps your screwdriver secure and handy for whatever use may come up. Your logo and information can be imprinted on the barrel of the screwdriver to advertise and promote your business. To request a quote on a Promotional Pocket Screwdriver Click Here . Quantity discounts available.